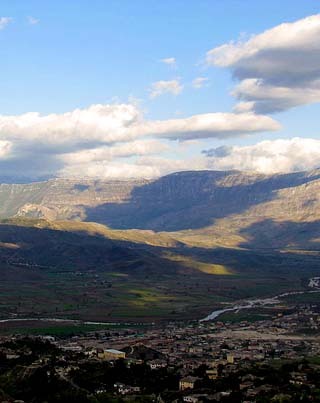 Albania is partly a broad and swampy coastal plain fronting the Adriatic Sea. From there, making up roughly 70% of the country, the land rises into hills and mountains. Major ranges include the Albanian Alps, and the Korab and Pindus Mountains. The highest point is Mt. Karabit in the Korab mountains, which runs along and through the Macedonia border, at 9,066 ft (2,764 m). From the mountains, flowing inland toward the Adriatic Sea, significant rivers include the Drin and Vlore. The three major lakes of Albania include Shkodra (shared with Montenegro), Ohrid and Prespa (both shared with Macedonia). Lake Ohrid is the deepest lake in the Balkans, and reaches depths of 935 ft (284 m). Geography is the study of the physical features of the earth and its atmosphere, in addition to the human activity that affects these. Geography is the nature and relative arrangement of places and physical features. Earth's surface has been modified over millions of years by a combination of geological processes that include, but are not limited to, the uplift of mountain ranges, the growth of volcanoes, and the formation of drainage basins (in which the surface of the landscape drops and is filled with eroded material). Landforms are categorized by a number of physical attributes including rolling plains, broad valleys, deserts, coastlines, and the slope and elevation of mountains. Rivers are natural courses of water, usually freshwater, that flow towards an ocean, lake or sea, or sometimes into another river. In certain instances, rivers will either flow into the ground or dry up completely before reaching a larger body of water. River water is collected from precipitation, groundwater recharge, and the release of stored water in ice and snowpacks. Lakes are inland bodies of water that are fed and drained by rivers; there are also artificial lakes, constructed for industrial or agricultural use, hydro-electric power, domestic water supply, or simply for aesthetic purposes. Generally, lakes are considered to be temporary over geologic time scales, as they slowly fill in with sediments. Formed through tectonic forces or volcanism, mountains stretch and tower thousands of feet above the surrounding land. This page was last updated on August 12, 2015.